Dynaudio borrows near-flagship tech for new midrange Evoke speakers | What Hi-Fi? Dynaudio's new Evoke range of speakers feature some top-level technology the company has borrowed from its higher-end ranges. The Evoke range comprises two standmounts (Evoke 10 and 20), two floorstanders (Evoke 30 and 50) and a centre speaker (Evoke 25c). It uses an all-new Cerotar tweeter based on the designs found in Dynaudio’s near-flagship Confidence and Special Forty speakers. Dynaudio has developed a new Hexis inner dome for the tweeter (previously reserved for the Confidences), and by positioning it beneath the 28mm soft-dome diaphragm, it claims to have optimised airflow and reduced resonances. Typically for Dynaudio speakers, the new Esotec+ woofers feature the brand’s proprietary MSP (Magnesium Silicate Polymer) diaphragms. The 14cm woofers in the Evoke 10, 30 and 25C speakers have new surrounds and advanced Ferrite+ magnet systems for improved frequency response and dynamics, while the larger (18cm) drivers in the Evoke 20 and 50 borrow technology from the Contour and Confidence speakers. The Evoke 50’s 15cm midrange driver is directly derived from the £7500 Contour 60s, too. Available in four finishes (black gloss, white gloss, walnut wood and blonde wood), the Evoke series ranges in price from £1100 to £3900. 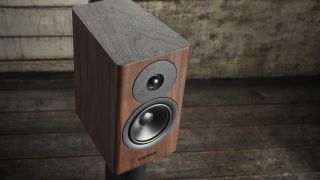 The Evoke 10 costs £1250, the Evoke 20 is £1800, the Evoke 30 and Evoke 50 floorstanders are £2900 and £3900 respectively, while the Evoke 25C is priced £1100.